some cotton and linen: backing: wool. 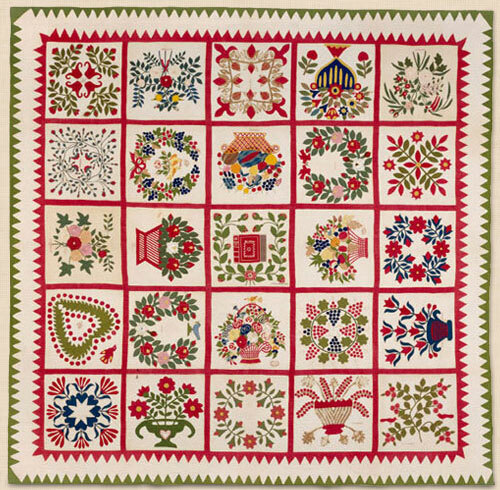 he Milwaukee Art Museum is proud to present more than forty exquisite quilts whose fabric, design, and stitchery combine to provide an extraordinary visual experience and a wealth of new information about the early American cultural landscape (1760–1850). American Quilts is drawn from the unparalleled collection of American textiles and antiques at Winterthur Museum in Delaware and features a stunning whitework quilt that survives with its maker’s correspondence, as well as some of the finest examples of early American printed textiles and a vibrant Quaker starburst wedding quilt. 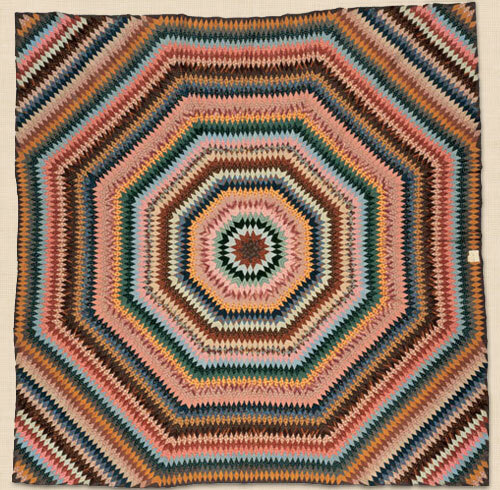 Through skillful needlework, graphic patterning, and an eye for color, American women transformed both common and exotic textiles into these singular works of art. One New England quilt demonstrates a frugal yet artistic re-use of a very common material—men’s wool breeches. In comparison, an isolated Maine quilt maker created an extraordinary patchwork quilt that incorporates fabric from more than one hundred richly colored dress silks imported from Europe and China ranging in date from the 1720s to the early 1800s. These scraps feature a kaleidoscope of designs from printed metallic dots on orange cotton velvet to hand-painted Asian flowers on silk, and illustrate that our global economy is not a modern phenomenon. 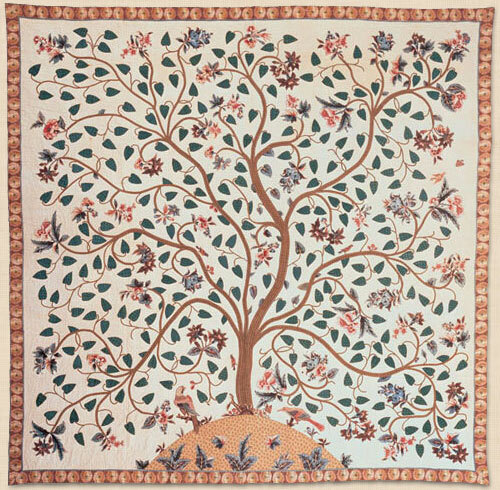 American Quilts explores how quilts were skillfully and lovingly made to commemorate the life-changing events of individuals, families, or entire communities. 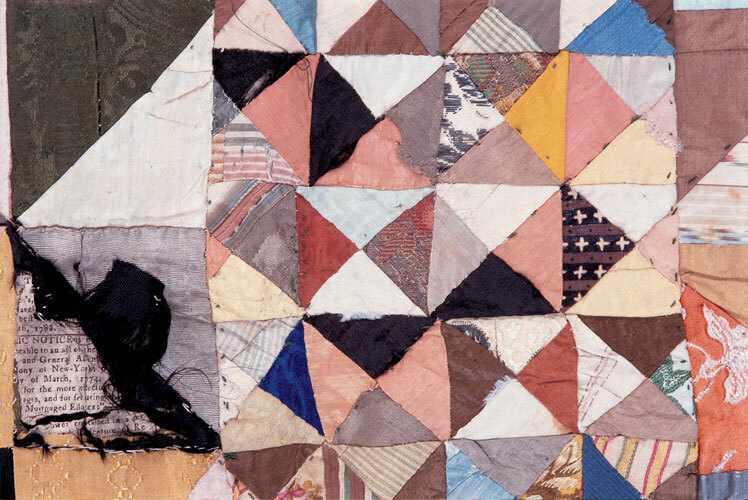 It shows how quilt patterns could reflect current fashion, or how certain imagery could make strong political statements. The rare quilts on view in this exhibition were passed through generations and, in turn, have become beautiful repositories of history and memory that document women’s political, social, and cultural lives in the early American republic. The exhibition is organized by Winterthur. The exhibition is curated by Linda Eaton of Winterthur and organized at the Milwaukee Art Museum by Mel Buchanan, Liz Flaig, and Catherine Sawinski.